IBM Engineering Workflow Management manages plans, tasks, project status, as the critical link between required and delivered work. It provides flexibility to adapt to any process, which enables companies to adopt faster release cycles and manage dependencies across both small and complex development projects. This solution offers no-charge server software and flexible pricing models. 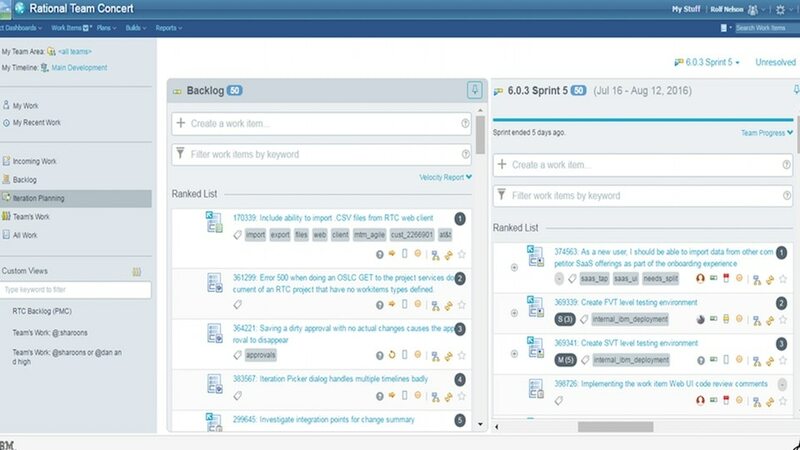 It becomes a complete IBM Engineering Lifecycle Management Base solution—when purchased as a set of seamlessly integrated tools: IBM Engineering Workflow Management, IBM Engineering Test Management, and IBM Engineering Requirements Management DOORS Next. Work on the right things with work tasks that link plans with development and execution. Linked work enables teams to find, fix and test things faster than using isolated, disjointed tools with fragile integration. Learn, adapt and change your process to meet your needs. Make every team high-performing by sharing best practices. Use the cloud to get up and running faster leaving you to focus on innovation.